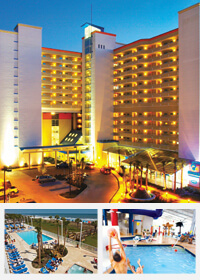 Myrtle Beach South Carolina is our specialty. Our team is committed to making the buying and selling of condos in Myrtle Beach, SC a pleasurable and rewarding experience. 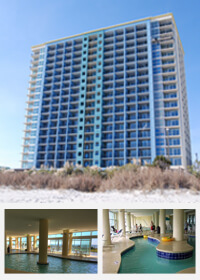 Our website allows you to search all active Myrtle Beach condominiums for sale. It is easy to use and navigate through condo searches. You can also save searches and get daily email alerts of new listings as they become available. Rated one of the nation's top vacation destinations with world-renowned dining, shopping, entertainment and golf, it's easy to understand why Myrtle Beach is also one of the nation's best places to invest in a vacation condo for sale as well. A subtropical climate makes it a true year-round resort and one that attracts more than 14 million visitors each year, almost all needing a place to stay. 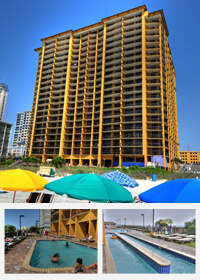 Just like the variety of attractions that have helped make Myrtle Beach and the Grand Strand America's playground, Myrtle Beach condos for sale offer a virtually limitless choice of features, amenities and locations. And with the nation's economic woes over the past several years, many of Myrtle Beach's oceanfront condos for sale are bargain priced and offer the investment opportunity of a lifetime. Of particular interest to many are "condotels," condos that operate like a hotel with staff, maid services, and offer another option for those looking to invest. 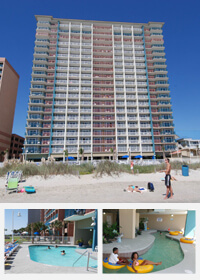 Located on the new Myrtle Beach Boardwalk in South Myrtle Beach, Bay View Resort features 2, 3 and 5-bedroom condos in a 25-story high rise with a prime oceanfront location. Units feature a number of upscale upgrades like designer furnishings, crown molding, granite countertops and more. Full kitchens, Wi-Fi, washer/dryer and all the essentials are included. Amenities include an indoor pool and Lazy River ride. Anderson Ocean Club’s 1, 2 and 3-bedroom condominiums feature private balconies and full kitchens with upgrades like cherry cabinets and granite countertops. Other room features include big-screen HD TVs, washer/dryer, and Wi-Fi. Property amenities include two large outdoor pools, indoor pool, Lazy River, kiddie pool, exercise facility, 24-hour front desk and business center. Featuring 1-4 bedrooms, Paradise Resort condos feature private balconies, designer furnishings, free Internet, cable TVs, washer/dryer and more. Efficiencies come with compact refrigerators and microwave ovens while condo units feature fully equipped kitchens and dining rooms. Amenities include outdoor pool with pool bar, Jacuzzis, and Lazy River, fitness facility, grill area and onsite convenience store. Two waterparks with a total of more than 30,000 square feet and a number of luxury upgrades are two of the many features and amenities of the great 1, 2 and 3-bedroom condos at Dunes Village. Features include granite countertops, tile flooring, solid mahogany contemporary furnishings, and more. The indoor waterpark features a 250-foot Lazy River, a huge indoor pool, hot tubs, waterslides and more.